I have spent plenty of time with Android and iOS devices over the past few years, but I never had a chance to dig into the relatively new Windows Phone 7. Although I had tried Microsoft’s new OS more times than I can count, the experience was quite refreshing when I got my hands on the HTC Arrive about two weeks ago. While it might not have a 3D screen, dual-core processors, 4G connectivity, or any crazy cutting-edge technologies, this phone can still get you through the day just fine. 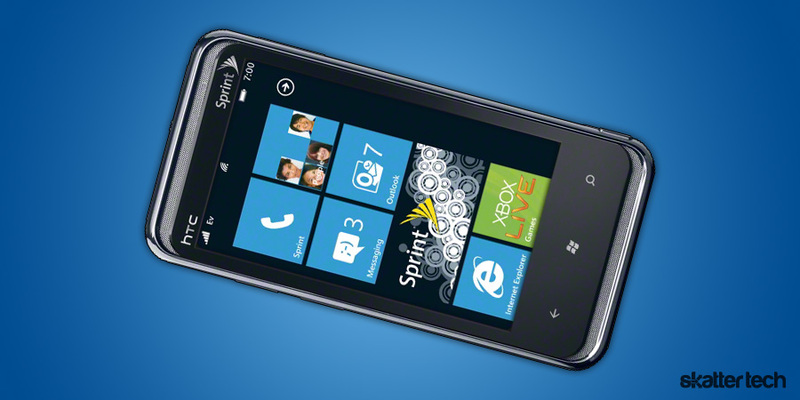 The HTC Arrive is also big news for Sprint customers since it is the carrier’s first Windows Phone 7 smart phone. It is also huge deal for Microsoft since their OS finally runs on a CDMA network. If you are counting millimeters while deciding to purchase a new smart phone, the HTC Arrive is probably not for you. It is a thick phone, but not due to poor engineering. In fact, it has an excellent design. A bushed metal back side with rubberized plastic surroundings offer a good grip and a glossy chrome finished bezel surrounds the front scratch-resistant glass screen. Since you are probably wondering at this point, the bulk is entirely due to one feature: a slide-out physical keyboard. While many phones have flimsy sliders, the HTC Arrive stands out from the rest. The spring-loaded mechanism snaps the phone into position quickly and it is quite easy to open with two hands. However I did noticed that the slider would occasionally get stuck half way if exerting too much pressure on one side over the other. It probably would take a lot of force to break, but I still wish it was as strong as the slider on the brand new Nokia E7. The HTC Arrive’s screen also awkwardly tilts a bit too far forward making typing difficult. While it is a perfect angle for enjoying a movie on a flat surface, I found myself leaning the phone downwards to type. Getting back to the basics, the front side of the phone only has three capacitive touch keys: back button, the famous Windows Start button, and one for search. For those wondering, that layout is a Microsoft requirement for Windows Phone 7 devices. Proximity and ambient light sensors are subtly hidden under the glass face. A standard 3.5 mm headphone jack is on top and a pair of HTC branded headphones come with the device. The power button — also on top — is quite recessed and lacks a tactile click. I found myself looking towards the screen to check it turned off. The volume rocker is on the left side along with the micro USB port which doubles for charging and data transfers. Having once been a physical keyboard fan starting with the ancient LG enV, I know a good keyboard when I see one. 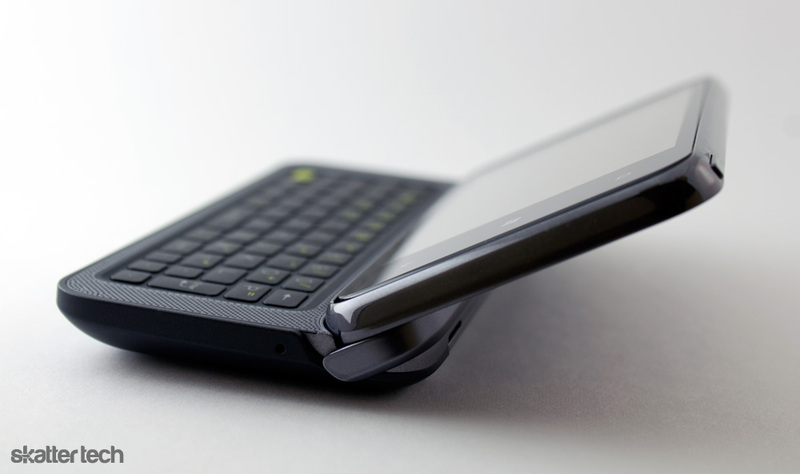 The HTC Arrive packs one of the best keyboards out there. Buttons are well spaced out and offer a tactile click with each press. There are five rows including ones for numbers at the top. LED indicators light up when the function or shift modifiers are in use. Rather than going with a grid layout, this keyboard has a traditional QWERTY arrangement. While it takes a few days to get accustomed to some keyboards, the smooth learning curve lets users dive right in without wasting any time. 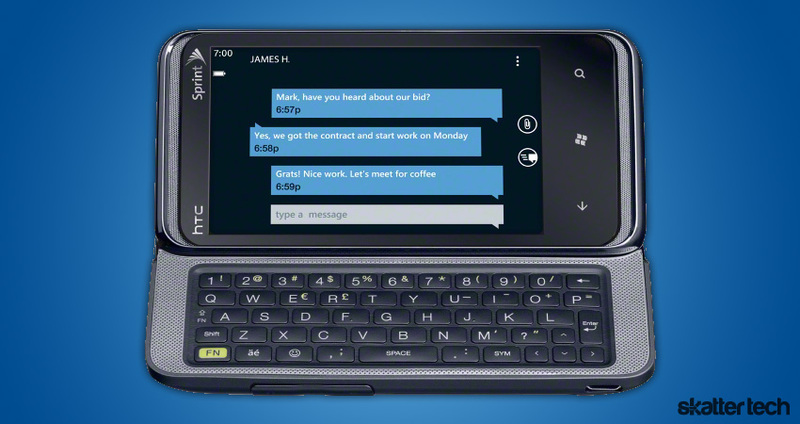 While I am glad to see a great physical keyboard, I eventually realized that I spent most of my time typing on the virtual Windows Phone 7 keyboard. Microsoft probably has one of the most responsive and easy to use keyboard I have come across. With HTC hardware, typing on-screen is as fluid as possible. It was definitely better than the stock Android 2.2 (Froyo) keyboard. However that is not to say that heavy mobile typers will not fully appreciate the physical keyboard for lengthy emails. 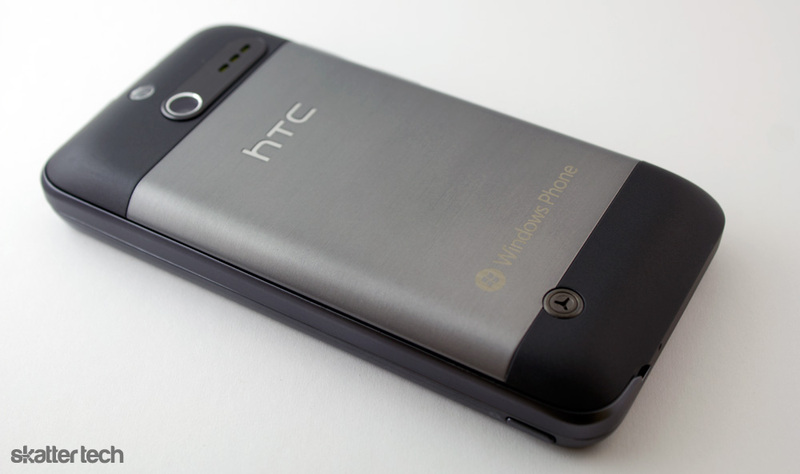 The HTC Arrive sports a 3.6 inch capacitive 800-by-480 pixel resolution WVGA screen. With a small screen and a large resolution, this smart phone actually ends up with a fairly high pixel density. I found that graphics, photos, and text look more detailed than other phones I have come across. It also feels as though the contents of the screen pop out at you rather than appearing recessed under the frame. Outdoor viewing under direct sunlight is still difficult and buyers would appreciate a brighter Super AMOLED display. The ambient light sensor pumps up the brightness, which makes it somewhat visible at the least. The responsiveness is also unbelievable. 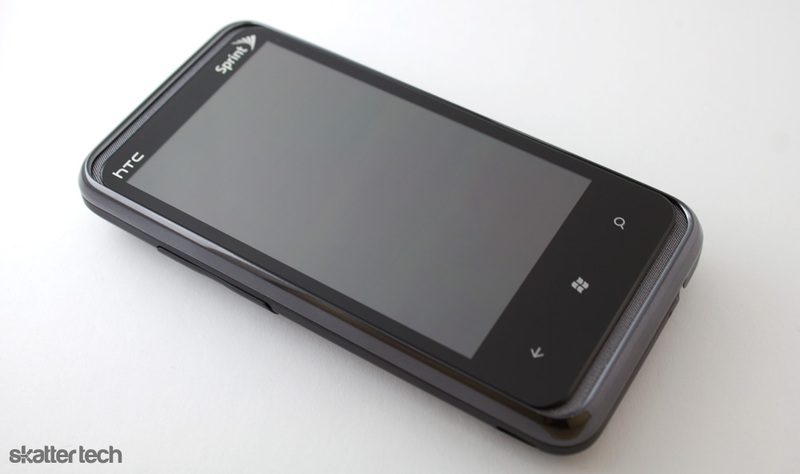 The Windows Phone 7 OS glides like butter to the touch of a finger. The inertia powered scrolling is also smoother than both Android and iOS. There is absolutely no lag and it feels as though you are touching the interface directly. Qualcomm’s 1 GHz Snapdragon processor, found on many recent smart phones, complements the Windows Phone 7 OS perfectly. For those who have not used Microsoft’s new mobile OS, it is quite different from the traditional icon-based home screen interface found on Android and iOS devices. Users can add live tiles to their home screen for quick access to the information they value the most. These interactive tiles shuffle through photos, display upcoming appointments, missed calls, unread emails, and much more. Swiping the main screen to the left reveals a full list of pre-installed and downloaded apps. While out of the box apps run quite fast, I have noticed that 3rd party apps often take a few seconds longer. Since Windows Phone 7 does not support background processes for 3rd party apps, users will have to wait until their phone fetches new data to use apps such as Facebook or Twitter. 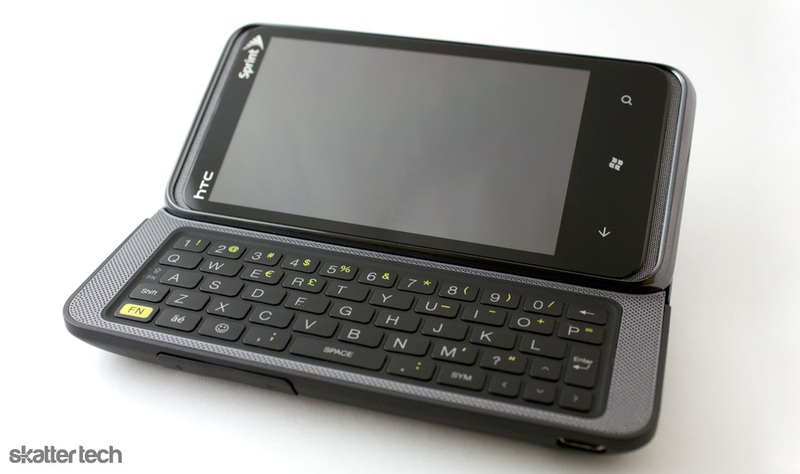 The HTC Arrive ships with the latest version of Windows Phone 7 to date entitled “NoDo.” This includes the ability to pause and resume apps. Clicking on the Windows Start button while in an app takes you back to the main screen. You can launch another app if you wish to do so. Heading to main screen again with the same button and using the back key lets users cycle through paused applications. While having to remember the order of last used applications is a nuisance, the resume feature does speed up relaunching apps. The next major update will apparently bring an app switcher and I can only hope that it is more straight forward. This smart phone also features copy and paste, which is something Windows Phone 7 did not offer until just a few weeks ago. Double tapping on a word brings up selectors to adjust the highlighted text. A copy icon appears overhead. It is a fairly decent implementation, but Android 2.3 and iOS 4.3 still handle it a lot better. I also found that some apps still do not support copying text. In addition to the aforementioned fluidity and responsiveness, I should note that animations and transitions are smooth and instantaneous. Rather than normal fade or slide effects, Microsoft goes for a unique flow that deviates from the rest. The live tiles flip away when launching an app, text slides horizontally while swiping through an app, and the interface crunches if you reach the end of a list. I found that Windows Phone 7 is very consistent and just about every last pixel of the interface is well polished. The minimalist look is not as colorful as other mobile operating systems, but it does offer a refreshing modern take on user experience. The two-tone colors are something that might be an acquired taste for some. After setting up a Windows Live account, I also logged into Gmail. The phone instantly fetched my calendars, contacts, and emails. There is also support for Outlook, Yahoo, POP, and IMAP out of the box. The dedicated search key brings up the Bing app for searching the web, locals, or news. 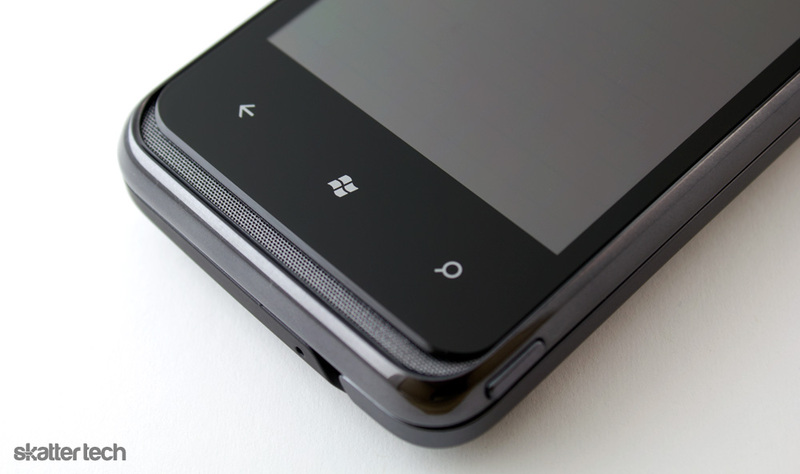 Holding down the Windows Start button launches voice commands. The Windows Phone Live website lets users track a lost device on a map, ring it when out of sign, lock the device leaving a note on the screen, or even remotely wipe all data. While Android and iOS have tabs within apps for viewing more information, Windows Phone 7 stacks pages side-by-side with a seamless flow. Users can swipe through each section and cycle back to the beginning too. Most quality apps stay in line with this unique layout. Grabbing new apps is also easy and the Marketplace prominently features hand-picked ones. There are sections for top paid and free apps for easy discovery. Users can quickly update all downloaded apps with just one click. I found that the Marketplace still lacks apps for some popular services including YouTube. The official solution simply launches a web page and a HTC built one was not too great. However, other apps for established services were top-notch. Netflix is brilliant with neat interface for browsing through content and streaming video works quite well. The Shazam app is simple, getting right to the point. Amazon, Facebook, Flixter, IMDB, and Twitter stick to the metro style. A Sprint Zone app comes bundled with the phone, but it was easy to remove. 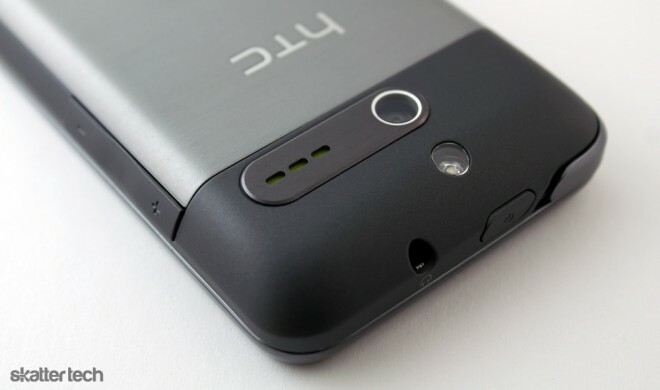 The HTC Arrive sports a 5 megapixel camera with auto-focus and flash. There are on-screen controls for digital zoom. Switching over to video mode allows for 720p HD capture. While the picture quality nothing out of the ordinary or spectacular. Images look somewhat compressed with washed out colors. If lighting isn’t just perfect, images pick up a lot of noise quickly. Video quality is not much better, but the sensor allows real-time auto-focusing which is a great addition. However, here is where things get better. 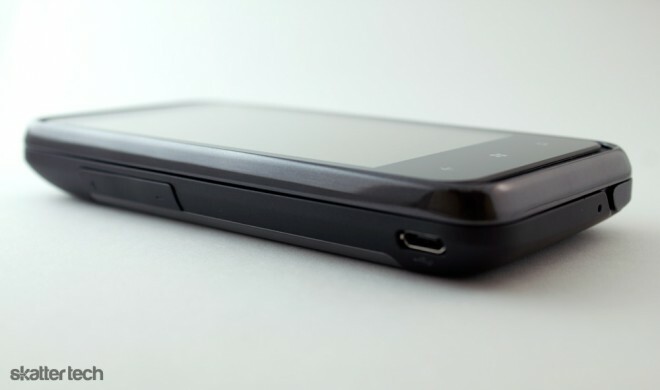 This phone has a dedicated capture button, while devices such as the Apple iPhone and most Android smart phones lack. A quick second-long click launches the camera app despite what you are doing. You can bring up the viewfinder instantly even if the display is off. Pressing down half way focuses and a full press snaps an image. The 1500 mAh battery takes this phone through at least a day and a half unlike other smart phones. The operating system is quite efficient and it runs longer on a single charge than the Android powered HTC Thunderbolt or HTC EVO. I could enjoy a half-hour long TV show on Netflix, spend some time browsing the web, make about an hour worth of calls, snap a few photos, install a few new applications, check in on Foursquare, and much more without too much concern for running out of juice. The advertised talk time is 6 hours and their claim was about right. Replenishing the battery is fairly easy since a micro USB cable comes in the box with a USB wall charger. When it comes to pulling the trigger, there are some things you should consider. The selection of Windows Phone 7 apps are still minimal compared to the competition. When smart phones such as the Motorola Atrix 4G or HTC’s own EVO 3D sport dual core processors, the HTC Arrive seems quite behind the times. With that being said, I should note that this is probably one of the best Windows Phone 7 devices on the market, if not the best. The mix of Microsoft’s software and HTC’s hardware is a perfect match. The keyboard is also a great addition for heavy messaging fanatics. The Windows Phone 7 operating system has a lot of potential is in a class of its own, but it is still truly a first-generation platform. Microsoft has a long way to go and I can only expect a better experience a few months or a year down the road. It is definitely a great device for early adopters, Windows fans, or those who just want something different. While it may not have extra perks such as a mobile hotspot or video chat capabilities, it has you covered when it comes to all the productivity basics. The HTC Arrive goes for $199 after agreeing to a new two-year contract through Sprint. Just got the Arrive this past Saturday and think it’s a great phone. Copy/paste works better than I think you’re stating. As far as Windows Phones features there’s a lot to like such as Zune Pass. There are a bunch of great Youtube apps in the marketplace that are better than the official Youtube plug-in. I love the Lazy Worm Youtube 2.0 app since it plays video in High Quality over 3G and it allows you to rate videos, comment, view subscriptions, and download videos to the phone. Yes, the Lazy Worm player is very nice. The Marketplace actually has a lot of decent apps in it and is growing quickly. Already 13,000 there now and growing somewhere in the neighborhood of 1,000 a week. Lack of of apps isn’t even a problem anymore with this phone after less than 6 months on the market. Windows Phone 7 is maturing at a very quick clip. I think it will be an exciting year. Hopefully Microsoft releases some major updates for multi-tasking soon. If they also open the doors to more APIs, it will also cause a flood of even better apps. That is not to say that the ones aren’t already good. I think Netflix, Shazam, IMDB, and a ton of the apps in the “top list” are quite unique implementations. They aren’t just a port over from Android or iOS. I also think we can see a large surge in apps when Nokia starts pumping out their hardware for WP7. When it causes a surge in the global market share for Microsoft, it will attract more development too. Odd, thus far I get the day with a few hours of phone calls using BT, a little web and Marketplace browsing browsing and Zune playback. Battery life is typically pretty good with Windows Phone devices. 1) You ended up with a defective unit, which you can probably replace easily if within the first few weeks (I think). 2) The area you are in had poor signal. Battery ran out quickly since it was probably trying to search for a signal. We got our review unit yesterday and after a full charge, I’ve yet to charge it again. I expect it to die by the end of the day today, but that’s still rather impressive. MY daughter and I bought the HTC arrive a few weeks ago and have had no problems with it after finding out how to use it.This is are first smart phone purchased . My husband has the HTC Evo and I found it difficult plus very big and bulky. I was just wondering why they say that they didn’t sell that much of them. I think it is very user friendly.